Ms. Ronak Safarzadeh, an imprisoned student and a member of the Cultural and Social Association of Women of Azarmehr in Kurdistan has been subjected to numerous physical assaults by other prison mates. These assaults have taken place under the strict direction of prison authorities who have encouraged these kinds of brutal attacks on Ms. Safarzadeh. Ms. Safarzadeh has suffered serious injuries as a result of these attacks. Further it has been reported that a number of other political and social prisoners have been subjected to the same types of brutal attacks. Ms. Safarzadeh has been in pre-trial custody for the past 20 months as a result of her social and women’s rights activities. 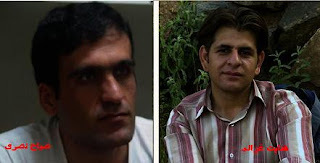 It has been reported that about a month ago, both male and female political prisoners I the prison of Sanandaj have been transferred to the section of the prison where very dangerous prisoners are being held. This has been done under the pretence of repairing the wards where political prisoners are being held. It must be noted that these prisoners (close to 103 of them) had been held in a very small and confined space for three (3) weeks before they were transferred to where the dangerous prisoners are being held. Student Council of Defense of Human Rights in Kurdistan: Even though Mr. Shabnam Madadzadeh has been granted a 50 million Toman bail, Judge Hadad refuses to release her. On May 27th 2009, even though all conditions for Ms. Madadzadeh’s bail had been met and the 50 millio Toman bail had been turned into court authorities, Judge Hadad refused to grant her release. According to Ms. Madadzadeh’s lawyer Judge Hadad has charged her with “ Fighting against the Regime” and “propaganda against the Regime”. Judge Hadad is well known for his mistreatment of student activists. In the past few weeks Judge Hadad convicted numerous “Amir Kabir” University students on charges of “involvement with opposition groups outside the country”, “organizing events against the upcoming election” and “drinking alcohol”. It must be noted that Ms. Madadzadeh and her brother have been in pre-trial custody in the Evin Prison since February 20th. Last week they were both allowed a one hour visitation with their family, where they informed their family that their interrogation had been completed and they had been transferred to the common ward in Evin Prison. Their families are extremely concerned about their health and well being. Ms. Madadzadeh is a student in Teachers Training Collage in Tehran and also an executive in student organization “Tahkime Vahdat”. Her brother Mr. Farzad Madadzadeh is a taxi driver in the city of Karaj. In response to the arresting of the Iranian workers in the city of SANANDAJ and LALEH Park in the Iran’s capital, Tehran, as well as other locations in the country, a protest was organized by the Committee in Support of Worker’s Rights in Iran, Toronto and as well as other leftist organizations, in front of the Islamic Regime Embassy in Canada on Wednesday May 27th 2009. Many workers rights activists and many of Iranians whom live in Ottawa, Toronto and Montreal participated to the protest. The protest started at 12:00pm and lasted until 2:30pm in spite of heavy rain. There were numerous speakers in this event who spoke about the crimes of the Islamic Regime. There was a speech by a representative of the Communist Party of Iran and also speeches by other leftist organization representatives. During those speeches the protesters strongly condemned the Islamic Regime actions about violating the human rights in Iran. The protesters also sang a number of revolutionary songs. At the conclusion of the protest the protestors sang the international song of Unity with the support of the Revolutionary Singer Ms. HOMA. Further on Saturday May 23rd 2009, a demonstration was organized in protest to presence of an Islamic Regime representative in the city of Toronto. A few days before that demonstration, the Islamic Regime Embassy via a few close media, had announced that one of their representatives would be coming to Toronto. Therefore the Embassy officials did not disclose the location by reason of fearing of those protests which were held by worker activists and freedom-loving people. Late Friday afternoon leftist activists were able to find out the location of the Islamic Regime representative which was in Hilton Hotel in Toronto. With the little time available to them, they organized a protest with as much people as was possible given the lack of time. The protest started at 10:00am and continued until 2:00pm in front of the Hilton Hotel. Then it was transferred to a very busy Iranian shopping centre. 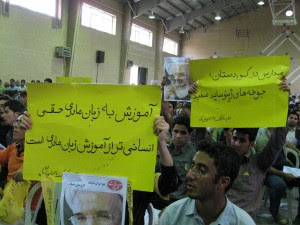 The protest included numerous speeches and slogans which condemned the Regime for its actions alongside of the Iranian worker activists. The Communist Party of Iran was one of the organizers of this protest. در پاسخ به فراخوان کمیته برگزاری مراسم اول ماه مه 88 برای آزادی کارگران دستگیر شده در سنندج، پارک لاله تهران و سایر شهرهای دیگر، روز چهارشنبه 27 مه تظاهراتی اعتراضی در مقابل سفارت جمهوری اسلامی در اتاوا به دعوت کارزار پشتیبانی از مبارزات کارگری در ایران- تورنتو و احزاب چپ برگزار شد . در این تظاهرات تعداد کثیری از فعالین کارگری و ایرانیان آزادیخواه از شهرهای تورنتو ، اتاوا و مونتریال شرکت داشتند. تظاهرات از ساعت دوازده ظهر تا ساعت دو ونیم بعد از ظهر با وجود بارندگی شدید ادامه داشت . چندین سخنرانی در تظاهرات بر علیه جنابتها و سیاست رعب و وحشت رژیم از جانب فعالین چپ ارائه گردید و تعداد زیادی پیام نیز که برای تظاهرات ارسال شده بودند، در محل قرائت شدند. پیام حزب کمونیست ایران و دیگر احزاب و سازمانهای چپ شرکت کننده در تظاهرات توسط نمایندگان این احزاب خوانده شد . در طول تظاهرات، شرکت کنندگان با شعارهای کوبنده اعمال ضد کارگری و ضد انسانی رژیم اسلامی را محکوم کردند. چند سرود انقلابی توسط هنرمندان انقلابی و کمونیست امیر و هما در تظاهرات خوانده شدند که با استقبال گرم شرکت کنندگان در تظاهرات مواجه شد. در خاتمه، سرود انترناسیونال، سرود همبستگی جهانی طبقه کارگر توسط هنرمند انقلابی هما و با همراهی شرکت کنندگان در تظاهرات اجرا شد . روز شنبه 23 مه، تظاهراتی در اعتراض به حضور نمابندگان سفارت جمهوری اسلامی، در تورنتو برگزار گردید. سفارت رژیم چند روز پیش از موعد، از طریق چند رسانه نزدیک به خودشان به بهانه خدمات کنسولی اعلام کرده بود که به تورنتو خواهند آمد، اما از ترس اعتراض و نفرت آزادیخواهان مکان آن را اعلام نکرده بودند. فعالین چپ در آخرین لحظات روز جمعه از مکان حضور نمایندگان رژیم که در هتل هیلتون بود اطلاع پیدا کردند و با وجود زمان بسیار کم تلاش نمودند تا تعداد کثیری از آزادیخواهان را در سطح شهر سریعا مطلع سازند. روز شنبه ساعت 10صبح جلو هتل هیلتون مرکز تجمع ایرانیان آزادیخواه و سوسیالیستی بود که به حضور نمایندگان رژیم جنایت و کشتار اعتراض داشتند. معترضین به حضور نمایندگان رژیم اسلامی، تا ساعت 2 بعد از ظهر در مقابل هتل هیلتون تجمع کردند و سپس تظاهرات را به یکی از بازارهای شلوغ و اصلی ایرانیها در تورنتو منتقل کردند و در آنجا هم شرکت کنندگان با سخنرانی ، پیام و شعار وجود نمایندگان رژیم جنایتکار اسلامی در تورنتو را افشا و محکوم کردند که با استقبال گرم مردم روبرو شد. فعالین حزب کمونیست ایران هم از سازماندهندگان این اعتراض بودند و در تمام لحظات تظاهرات حضور فعال داشتند. 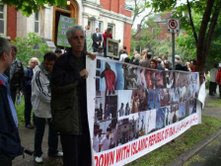 There will be a demonstration in front of Iranian Embassy in Ottawa at 12:00 PM on May 27, 2009. Labour and progressive organizations and activists around the world are standing in solidarity with workers in Iran, particularly for the freedom of all imprisoned labour activists and for the immediate stop of the persecution of labour and progressive activists in Iran. The May Day rally and celebration in Tehran, which was organized by independent Iranian labour organizations on May 1st, 2009, was brutally attacked by security and intelligence forces and hundreds were beaten and over 150 people arrested. The intelligence forces brutally attacked the event’s participants including women and children, by baton and tear gas etc. Many of these labour activists are still imprisoned. Those released have been put on heavy bail and will face charges. The Islamic Republic of Iran (IRI) does not recognize freedom of association and the right to organize, assemble and free speech and systematically represses all independent activities of workers and progressive forces in the country. The IRI is a cruel capitalist regime, which is fully implementing the anti-worker policies of global capitalism. Moreover, it’s a regime that has been jailing and killing tens of thousands of labour and women’s rights activists, students, socialists and other left and progressive forces in Iran. Join us in protest against the gross violation of workers’ rights to organize, assemble and frees speech! Protest against ongoing repression of workers and their organizations in Iran! Time: 12:00 to 3:00 p.m. This rally is organized by “The Solidarity Campaign with the Workers’ Struggles in Iran”, which is a collaboration amongst numerous Iranian labour, left and progressive activists and organizations based in Toronto. (New York) -The Iranian government should immediately release ailing political prisoner Behrooz Javid-Tehrani, a human rights activist first arrested during 1999 nationwide student protests, and ensure he has access to adequate medical care, Human Rights Watch said today. Javid-Tehrani, who has been continually detained since 2005, is on hunger strike and suffers from health problems caused by prolonged torture. A student activist and leading defender of the rights of political prisoners and their families, Javid-Tehrani has spent the last 10 years in and out ofprison. He is currently held in the "doghouse" section of the infamous Gohar Dasht prison in Karaj city, north of Tehran, with his hands and feet cuffed. "Behrooz Javid-Tehrani, who is critically ill, is in prison for his peaceful political dissent and his human rights advocacy," said Sarah Leah Whitson, Middle East director at Human Rights Watch. "He should never have been imprisoned in the first place and he should be released at once or he will likely die in prison." Javid-Tehrani, 29, has never had access to a lawyer, and has had limited access to his family since his 2005 arrest. Despite an independent medical examination in 2006 that confirmed he had been tortured while in prison, Javid-Tehrani has been refused release to obtain needed medical care. Amongst his current known ailments are fresh bruises and wounds to his body as well as the loss of 50 percent of his eyesight due to head injuries inflicted by his interrogators in prison. In addition, authorities have not provided adequate medical care during his 18-day hunger strike, according to his friend Kianoosh Sanjari, a human rights activist who was a fellow inmate during part of Javid-Tehrani's term inEvin prison in Tehran. Iranian officials first detained Javid-Tehrani on July 9, 1999, when he was 19, as he participated in student demonstrations that spread across Iran. He was sentenced to eight years in prison on charges of "acting against national security." Four years into his sentence, his sister phoned him to say their mother had passed away but the Iranian Judiciary refused to let him attend his mother's burial. His sentence was later commuted and he was released in late 2003. In 2004, he was detained twice, both times for demonstrating for the rights of political prisoners and their families in front of the United Nations offices in Tehran. Prison officials interrogated and tortured him in Section 209 of Evin prison in Tehran, Kianoosh Sanjari told Human Rights Watch. Sanjari became aware of Javid-Tehrani's torture in Evin because of the close proximity of their cells and the fact that they shared the same interrogator, an official who goes by the name of Saeed Sheikhan. In 2005, ahead of the presidential elections won by Mahmoud Ahmadinejad, Javid-Tehrani and others in an organization called Jebhe-ye Democratic-e Iran(the Iranian Democratic Front), organized activities such as putting up posters, distributing fliers, and writing political graffiti to protest the lack of transparency and lack of democracy in Iranian elections. The group also raised funds to help families of political prisoners and made short films interviewing the families. After Javid-Tehrani interviewed political prisoner Akbar Mohammadi during the latter's temporary release and shortly before Mohammadi's death under suspicious circumstances during a hungerstrike in prison, he was again arrested in 2005. According to Sanjari, that interview was of special interest to prison officials, who raised it repeatedly during their interrogations of both friends. The head judge at Branch 26 of the Revolutionary Court in Tehran, Judge Hasan Zare Dehnavi, known as Judge Hadad, sentenced Javid-Tehrani to four years in prison for membership in an "illegal" organization (the Iranian DemocraticFront) that "acts against state security," 40 lashes for "insulting the leadership and the state," and three-and-a-half years on charges of belonging to the Mojahedin'e Khalgh Organization (MKO). According to Sanjari, this charge was fabricated by the interrogator Sheikhan and furthered by a personal conflict with Judge Hadad, the judge who later sentenced Iranian-American journalist Roxana Saberi to eight years for espionage. An appeals court reduced the sentence on the MKO charge by six months. Javid-Tehrani has now served more than half his 2005 sentence. Most prisoners in Iran are eligible for release after serving half of their sentence, but he has not been granted even one day of customary temporary release since 2005. Human Rights Watch is concerned that Javid-Tehrani's life is in immediate danger, in light of the suspicious deaths of political prisoners at Gohar Dasht prison (also known as Rajayi Shahr), most recently that of Amir Heshmat Saran in March 2009. Gohar Dasht was one of the main sites of the 1988 mass summary executions of political prisoners which killed thousands. "Amongst Iran's political prisoners, Gohar Dasht prison is known as the ‘doghouse' because prisoners are sent there to die," said Whitson. "The Iranian government is legally bound to ensure safety and provide healthcare for all its prisoners. But it has consistently failed to do so for political prisoners, with deadly results." Human Rights Watch urged Iranian authorities to release Javid-Tehrani immediately and end its persecution of peaceful critics and dissidents. Student Council of Defense of Human Rights in Kurdistan: According to news received from Mr. Behrouz Javid Tehrani’s family, Mr. Tehrani is currently on his 16th day of hunger strike. Mr. Tehrani was forcefully transferred to Section 1 of the Gohardasht Prison (torture chambers) also known as “dark hole” or “the end of the road” more than 2 weeks ago. While in Section 1 of the prison he has been subjected to brutal torture, including being beaten by batons while blindfolded and handcuffed. According to his family Mr. Tehrani is in an extremely poor mental and physical state. Mr. Tehrani is a pro-democracy activist who was originally arrested during the July 9th 1999 (18 Tir) pro-democracy student demonstrations, and has spent most of the last decade in Islamic Regime prisons. For the past four (4) years Mr. Tehrani has been imprisoned in the infamous Gohardasht Prison, which is known for housing extremely dangerous criminals and for its terrible treatment of political prisoners. It must be noted that even behind bars Mr. Tehrani has continued his pro-democracy activities and this is one of the reasons behind the inhumane treatment of Mr. Tehrani by Regime Officials. Student Council of Defense of Human Rights in Kurdistan condemns the inhumane treatment of Mr. Tehrani and urges all human rights organizations and international entities to voice their concern over the torture and imprisonment of Mr. Tehrani in Gohardasht Prison. According to news from Section 1 of the Gohardasht (Karaj) Prison Mr. Behrouz Javid Tehrani who is currently on hunger strike is being subjected to brutal torture and his life is in danger. Since his transfer to Section 1Mr. Tehrani has been subjected to brutal torture. His hands and feet are cuffed at all times and he is blindfolded. Prison officials have beaten him for very long periods of time with batons. The marks of these beatings can be seen on his hands, feet and back. Mr. Tehrani is in an extremely terrible physical state and poor health because of his hunger strike as well as the brutal torture he has been subjected to. There is great concern that Regime Officials maybe trying to “eliminate” this prisoner. Individuals who have personally subjected Mr. Tehrani to torture are Ali Mohammadi (the prison warden), Kermani (Head of prison security and intelligence) and Tabibollah Farj Nejad (second in command of prison security and intelligence) as well as numerous other prison officials who have subjected Mr. Tehrani to torture as a group. Usually the prisoner is placed in the middle of the torture chamber and attacked from all sides and beaten by batons. Since his transfer to Section 1 Mr. Tehrani has had no contact with his family. His family had gone to prison on numerous occasions to try to visit him, however they were told by prison officials that his visitation and phone privileges had been revoked. Finally on Monday May 18th 2009 after refusing to take no for an answer his family was granted a short visit. It has been said that his body was battered and bruised and he was in a terrible physical state. All signs point to the fact that the Ministry of Intelligence is trying to “eliminate” Mr. Tehrani and his life is in serious danger. The individuals responsible for his torture have threatened him numerous time with death and “elimination”. To this date Mr. Valiollah Feyze Mahdavi, Mr. Abdolreza Rajabi adn Mr. Amir Hossein Heshmat Saran have “died” under similar circumstances in Gohardash Prison. Because of lack of international investigation and lack of punishment for those responsible for those deaths, similar fate could be awaiting other prisoners especially Mr. Tehrani. Kurdistan Media: According to Kurdistan Human Rights Organization Mr. Ahmad Namuyi, resident of the city of Selmas, who had been arrested 9 months ago on the charges of working with an anti-regime Kurdish group has been sentenced to 15 years of imprisonment, without the right to appeal. Mr. Namuyi was arrested last fall in the city of Mahabad. It must be noted that he was not given his right to counsel and his sentence is such that he is not legally able to appeal it, making the 15 years jail sentence final. Kurdistan Media: According to Kurdistan Human Rights Organization Mr. Farhad Hajmirzayi and his sister Ms. Parshang who had been summoned to Branch 1 of the Revolutionary Court in the city of Sanandaj on Sunday May 17th 2009, to follow up on their on-going case have been arrested. Mr. Hajmirzayi was released on a 430 million Tooman bail three (3) days ago after 16 months of pre-trial custody. Mr. Hajmirzayi’s family has no information about their children’s whereabouts. Kurdistan Media: According news from Mukriyan news agency a young man from Bukan, named Mohammad Ghaderi was sentenced to a term of imprisonment by the Revolutionary Court in the city of Mahabad. Mr. Mohammad Ghaderi spent some time in prison last year and was later released on bail. Mr. Ghaderi was convicted of “propaganda against the Regime” by the Revolutionary Court in the city of Mahabad and sentenced to four (4) months imprisonment. Mr. Ghaderi was taken into custody on May 13th 2009 and transferred to Bukan Prison in order to start serving his sentence. Recently I had a chance to do an interview with Donna Hakimian, a project coordinator at the Canadian Baha’i National Centre, who spoke to me about the 1 year anniversary of the arrest of 7 Baha'i Leaders in Iran. Please find her interview below. 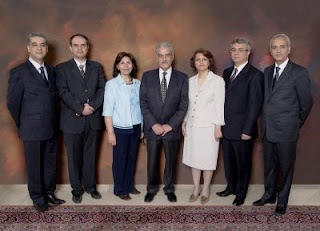 1) As the Iranian government has sought, through propaganda in government owned media outlets, to spread falsities about the Baha’i Faith, please explain a little bit about the history of this community. While there is much more to this community those are some of the key concepts to which this community adheres. 2) On this one-year anniversary of the Yaran being held in Evin prison, what can you tell us of the situation? What is the situation like for the rest of the Baha’i community in Iran, for those who maybe unaware? “The seven Baha’i leaders have been held in prison for over eight months and no evidence against them has been brought to light. Further, at no time during their incarceration have the accused been given access to their legal counsel, Mrs. Shirin Ebadi. Mrs. Ebadi has been threatened, intimidated, and vilified in the news media since taking on their case and has not been given access to their case files. In December, the government moved to shut down the offices of the Defenders of Human Rights Centre, which was founded by Mrs. Ebadi. “The government must now allow Mrs. Ebadi access to the prisoners and to their files,” said Ms. Ala’i. 3) Why is such a persecution important for this community, but also for the entire population of Iran, whether Baha'is or not? The idea that you can judge a nation's development by how it treats it most vulnerable citizens is particularly apt in this context. As we see in Iran, being a minority, whether linguistic or religious, can result in violence, social marginalization and many forms of persecution. A point though that I think is important to raise is that Iran has such diversity and regional particularities that almost everyone can be considered some form of a minority. The illusion of a homogenous Iran population is both inaccurate and a particularly dangerous way of seeing our nation. The beauty of Iran lies exactly in this diversity whether Baluch or Kurd, Zoroastrian or Christian, Baha’i or Muslim. Just as the landscape of Iran is noted for geographic diversity, this diversity is reflected back by its population. Do we curse the desert for being arid and dry? Or punish the North of Iran for its lushness? The thought of persecuting the trees and sea in different regions is absurd. How then can we justify and stand by when ethnic minorities are faced with violence for speaking their mother tongue? Or when Baha’i youth are not allowed to attend university because of their belief, a belief that is absolutely non-violent? Baha’is stand in solidarity with all those innocent Iranians desiring freedom. 4) What do Baha'is feel about the situation of human rights in Iran? Do you feel for example, the crackdown on women's groups and student activists to be a concern for your community as well? As a member of the Baha’i community, I have always had a deep affinity for Iran. I see this also with so many non-Iranian Baha’is, they themselves often learn Persian, give their children Iranian names, and know the geography and history of Iran. A falsity the Iranian government is spreading is that Baha’is are not supporters of their homeland. While a central principle of the Baha’i Faith is the oneness of mankind, and many Baha’is travel and live in different parts of the world. This does not make Baha’is anti-Iranian, or in any way less Iranian than their fellow citizens. Ironically, following the Iranian Revolution thousands of other Baha’is were forced into exile. I myself was raised in a household where there was a deep reverence for our homeland, along with the language, literature and other cultural traditions. Such an attitude then makes it very hard for me to witness the violations of human rights of thousands of Iranians daily. I do not see myself as separate and different from the people of Iran. The pain and suffering of a women, student leader and child prisoner in Iran is the suffering of all Iranians. It is also the obligation of all of us to work shoulder to shoulder in the creation of a just and peaceful society. 5) What do Baha'is feel people can do for this community? How can awareness be raised? Just as you have done in this blog, raising awareness on the persecution of the Baha’i community can be done through blogs, websites, and various media outlets. Other avenues are academic research on this subject, or simply contacting the Baha’i National offices in the country with which one lives and requesting information for one’s personal knowledge. The following websites in English http://www.bahai.org/ and http://news.bahai.org/ and the following in Persian http://info.bahai.org/persian/index.html all have useful and pertinent information. When fair-minded and just individuals can speak out in defense of the Baha’is, as well as other targeted groups in Iran, a ray of light is shed upon the darkness of such injustice. As the current Iranian government has worked to spread misinformation about the Baha’i Faith simply knowing the truth about this community, and sharing it with individuals inside Iran, is a positive step in defending the rights of its members. It is the integrity and courage of the Iranian people, as has many times been exemplified, which promises the bright future that Iran is no doubt destined. As I have already mentioned before, the respect and rights towards all the citizens of a nation, regardless of ethnicity and belief is a goal that is the responsibility for all individuals to work for, whether inside the country or not. Mehdi Karroubi who is a presidency candidate for the upcoming elections in Iran visited the city of Kermanshah and the university students on Monday May 11th 2009.In particular the presence of Kurdish students was extremely strong as can be seen by the photos above. 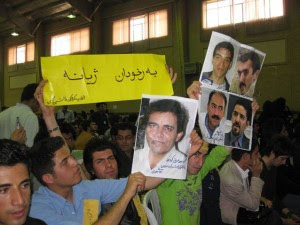 The Kurdish students held up pictures of political prisoners such as Yaser Goli, Habbibollah Latifi, Farzad Kamangar, Mohammad Sadeiq Kaboudvand and Ms. Zeynab Beyzidi, as well as posters with slogans such as “Unemployment of young people in Kermanshah for how long?”, “Stop Executions”, “Free student prisoners” and “Free political prisoners” to name a few. 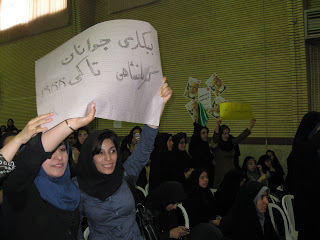 The students also shouted these slogans throughout the speech of Mr. Karroubi. I am once again amazed by the courage of these students who are willing to stand up against tyranny (even in face of danger). To see this kind of strong support for political prisoners and the kind of unity these students have is certainly a great indication of hope. My only concern however would be for the Iranian people and students in particular to once again fall for the slogan of “reform” and to vote for these international criminals, rather than boycotting the elections. I hope the people of Iran have learned their lesson after Khatami and his 8 years of Reform. Student Council of Defense of Human Rights in Kurdistan: Mr. Sabah Nasri and Mr. Hedayat Ghazali who were released from prison in January 2009 after 1.5 years of imprisonment have been expelled from university, due to their student activism. After their release from prison these students applied to their respective universities, in order to be allowed to continue their education, however both universities have rejected this request and expelled these students. Mr. Hedayat Ghazali was a psychology student in the University of “Tabatabayi” and also wrote for the student paper “Rojame”. Mr. Sabah Nasri was a political science student in Tehran University. He was also the editor of the student publication “Mazbur” which was in operation until Mr. Nasri’s arrest. These two students were originally arrested in the city of Sanandaj. They were in pre-trial custody for 14 months and were transferred to Section 209 of the Evin Prison on numerous occasions. After 5 court proceedings they were both sentenced to two years of imprisonment by Branch 13 of the Revolutionary Courts. They were convicted of “Propaganda Against the Regime” and “Participating in illegal gatherings on the occasion of International Mother Tongue Day.” However on appeal their sentence was reduced to 1.5 years imprisonment and they were released on January 5th 2009. Student Council of Defense of Human Rights in Kurdistan: In the past few days tens of Kurdish individuals have been arrested by security forces and taken to unknown locations. In the village of “Salvat Abad” in the city of Sanandaj the security forces attacked the homes of number of residents at 4:00am on May 10th 2009 and arrested number of young men including Mr. Chiya Rahimi(22). They beat him and took him to an unknown location. In the city of Sanandaj security forces arrested a male named Mr. Farshad Jalali. After searching his home and confiscating his computer and some of his personal belongings he was also taken to an unknown location. Further in the past few days security forces have arrested number of individuals around the “Kamyaran” area. On Wednesday May 6th 2009, six individuals were arrested in the village of “Alek” as well the homes of these individuals were subjected to search. The names of the individuals arrested are as follows: Mr. Keyhan Pirouzi, Mr, Ghahreman Pirouzi, Mr. Saman Pirouzi, Mr. Reybavar Pirouzi, Mr. Fardin Veysi and Mr. Akam Pirmaghani. Further three individuals in the village of “Nilkuy” were arrested and there is currently no news about their whereabouts. Further in this city a lawyer named Javad Marabi was arrested at his work place and taken to an unknown location. Another young individual who was recently arrested is Mr. Khaled Gholami from the village of “Palangan”. Mr. Gholami has travelled to the city of Kamyaran in order to buy medicine for his ill mother. After his arrest security forces searched his home and announced that Mr. Gholami’s younger brother Mr. Saraj Gholami (18) must also turn himself in to the authorities. The mother of these brothers passed away yesterday however the security forces are still insisting that Mr. Saraj Ghoalmi turn himself in even at this difficult time for the family. This situation has caused great concern for the residents of this area. Further Mr. Verya Naghashbandi was arrested at 8:00am on Monday May 4th 2009 in the city of “Mazkur” and taken to an unknown location. Mr. Naghashbandi is a labour as well as a social activist. He has not had any contact with his family since his arrest. On Thursday May 7th 2009 security forces arrested three other residents of the village of “Shaygani”. These individuals are: Mr. Moslem Khateri, Mr. Zahed Ghayadi and Mr. Anwar Setami. These individuals were also taken to an unknown location. Further Mr. Amir Babkari and his wife have also been summoned to the Ministry of Intelligence. Mr. Babkari had spent the past 16 months in prison and had been exiled from “Piranshahr”. Mr. Babkari ran a Kurdish/Farsi newspaper called Reyvan which was suspended by the authorities. Also last week three students from Mariyvan who were studying in Orumiyeh and Sanandaj universities have been arrested along with a number of other residents from Maryvan. It must be noted that absolutely no information has been given to the families of the individuals arrested. There has also been reports of arrests in the city of “Iylam.” A teacher named Mohammad Melki was arrested a week ago by security forces and there is no news about his whereabouts. Tamil Protests on University Ave. I was in downtown toronto last saturday and passed by the Tamil protests which I guess had just started. I know a little bit about what is going on in Sri-Lanka and decided to stop and speak a little bit with the protestors. It seemed to me like most of them were supporters of Tamil Tigres, which is definatly a organization that I do not support, but as the week has gone by I am amazed at the determination of these people, protesting in front of the US embassy (what ever their cause maybe) for days on, brining traffic to a halt in one of the most important areas in downtown!! I guess the question in my mind is why aren't we Iranians doing the same thing?????????? The last time I checked our people are being persecuted, imprisoned, tortured and even executed on a daily basis. Toronto has a huge Iranian population, so many of them Anti-Regime and yet when it comes to action we are all very much silent. I used to think protests are not very effective, but on a second thought if we can gather 200 people in downtown Toronto even for a week, I have a feeling it would make a huge impact. So why is it, that in a city where there are about 100,000 Iranians we cant even come up with 200??? Iranians in TO let me know what you think! !